Having a mobile application for business is no more a requirement but has eventually become a necessity. A recent study revealed some impressive statistics about the mobile app revenue projection in 2020. According to the survey, mobile app development has a very bring future, and it is projected to rise to $189 billion by 2020 which is quite a considerable number. All the customers are using mobile apps which mean there is a huge market for custom mobile apps. Because mobile app development is the most rapidly growing sector in the industry, custom apps for Android is an excellent choice for any business, and this opens a tremendous opportunity for an Android app development company in India. Android is a majority of mobile phones supports an open source operating system hence gives a great market to generate immense business opportunity and see the growth. 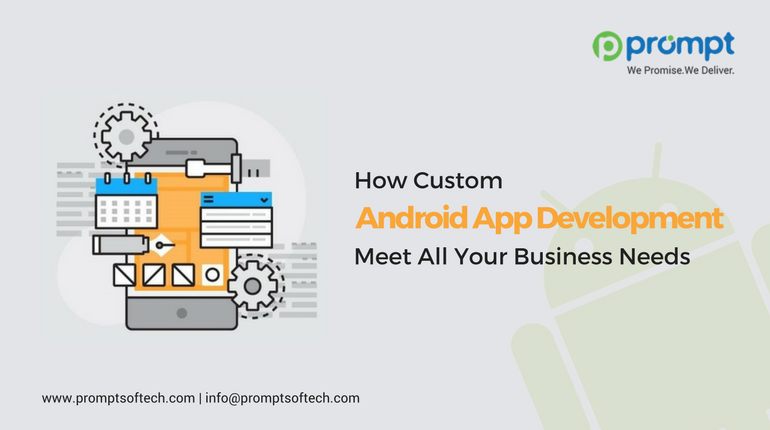 Most of the applications available in the market are off-the-shelf and can be customized quickly; however, the demand for custom apps for android is gaining importance. Every business is unique and demands a unique solution. The readily available apps are often targeted to meet the unique business requirements and come up with excellent quality at the same time these can be an obstruction to your business. Though, the top Android app development companies in India come up with ready innovative and individual apps. But not all can seamlessly fit into your business model. Mobility is at the heart of each enterprise’s digital strategy. Any mobile application which does not give mobility is merely useless. You cannot win your customers if your application doesn’t provide them with the mobility they require. Enterprises are moving forward to Android for building custom mobile applications to boost their mobility and accomplish remarkable business augmentation significantly. Custom apps for android might sound a bit deceptive because of the cost included for customizing it. However, as a business owner, you will only have to pay for specific features that are required by you. Whereas other charges such as licensing costs, installation and training costs can be waived off in case of custom apps. Since a custom app is built from scratch keeping in mind the niche requirement of the business and the end users it becomes easy to understand and very less training is required hence excluding the time spent on training the staff and eating up productive hours of the operations staff. Security is always the first fact considered while considering the android applications. Since the app is build keeping in mind your business needs there is very less to none chances of competitors knowing about the architecture of the app. Moreover compared to any third party app, custom-made android applications eliminate the security risks. The excellent technical support is one of the significant factors which are provided by Android app Development Company in India hence making it the most preferred choice for businesses. They are known for providing inexpensive, reliable and dedicated support from the team who have built the application from scratch. This can prove to be quick and efficient technical support for all the issues that come up. For companies who favour the BYOD policy, it is recommended to go for Android as the enterprise app development platform as it supports a variety of devices and users of all economic groups. Android SDK which is required for software licensing is available for free. Moreover, Android platform is designed in such a way that it allows integration of multimedia tools and data management functions because of its flexibility factor. It provides timely updates, and hence all these factors help them to quickly recover the investment made in app development by gaining profits within in short duration. The trend of Android wearable devices is at its peak because of its quick communication and interacting functionality. A survey says there will be a drastic increase in the number of connected wearable devices worldwide which will reach up to 830 million in 2020. Hence developing device compatible custom apps for Android will prove to be beneficial for a business to gain more profits and attract the user base from various parts of the world. One is the essential factor is positioning your business among the competitors. Custom apps for Android help you to give a great platform to your customers where can communicate with you and share their grievance. Hence gives you a competitive edge. Customizing mobile app for Android provides you with a pool of benefits which will enhance the growth and productivity of your business. In a technically advanced era will help you in improving your service offerings to your target customers and streamline your business processes alike. Android apps are built and scripted in Java programming language that uses a superior set of libraries. Any mobile app developer who has worked with Java language can create and collaborate on Android apps with no much trouble. As per a research, many Java specialists’ find it simpler to write mobile apps for Android as a contrast to developers with expertise in other programming languages. When you decide on to develop a mobile application on Android, you should not only think about smoothening the operational processes but also add immense value to your marketing and sales services. Our mobile app developers at Prompt Softech deliver solutions par brilliance in meeting the objective proposed by our clients at all the development or even at quality testing stages. Our mobile development teams lift up the company deliverables by developing the most excellent mobile apps focused on effortlessness and make complicated things easier to use. Let us assist you to strategize and create the needed Android mobile app solution for your organization.